My Pluralsight course “Dynamic C# Fundamentals” is now available. 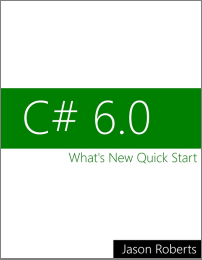 Module 1 introduces the dynamic features of C# and how it is enabled by the Dynamic Language Runtime (DLR). Module 2 looks at numerous places that dynamic C# can be used including COM, XAML, MVC, and JSON. Module 3 digs into more detail and shows how to create custom C# classes that can exhibit dynamic behaviour. Module 4 shows how the DLR enables C# to interoperate with other dynamic languages such as IronPython. Check out the full course description. FeatureToggle is an open source feature toggling / feature switching library for .NET. Version 3.4 Introduces an new additional way to get the value of whether a toggle is enabled or not. With v3.4 a new additional fluent way is introduced to improve readability and offer a convenience when evaluating a toggle. SpecFlow is a tool that can translate natural language scenarios (e.g. writing in English or other spoken languages) into test code. This can allow business people, users, or other stakeholders to verify that the correct features are being built. Selenium is a tool that allows test code (multiple programming languages supported) to automated a web browser. This allows the creation of automated UI tests that operate the web application as if an end user where doing it; for example clicking buttons and typing text into input boxes. My new Pluralsight course shows how to integrate these two tools. If you’re new to SpecFlow I suggest watching this course first before moving on to Automated Business Readable Web Tests with Selenium and SpecFlow. There’s been a number of almost-goosebump-inspiring moments during my .NET dev experience such as the first time I saw my code running on a Windows Phone 7. Another one of these moments was seeing my code running on my Xbox One for the first time. It is now possible to take your regular Fallout 4 playing retail Xbox One and turn it into a development machine. 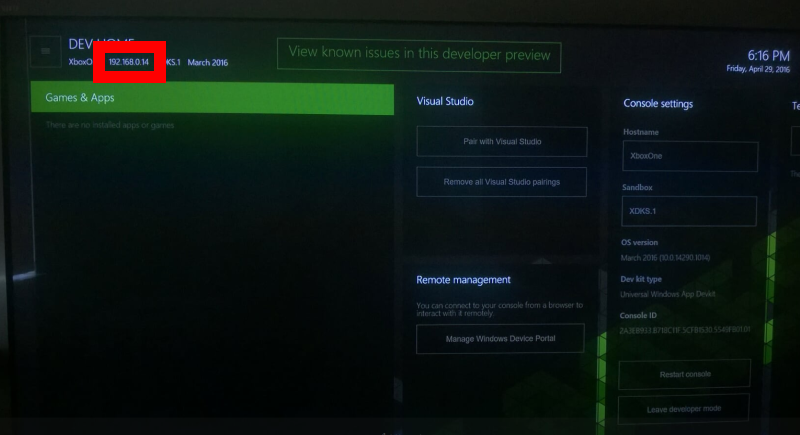 This allows the running of Universal Windows Platform (UWP) apps. At the time of writing this is in preview/pre-release status with a final release expected later this year. 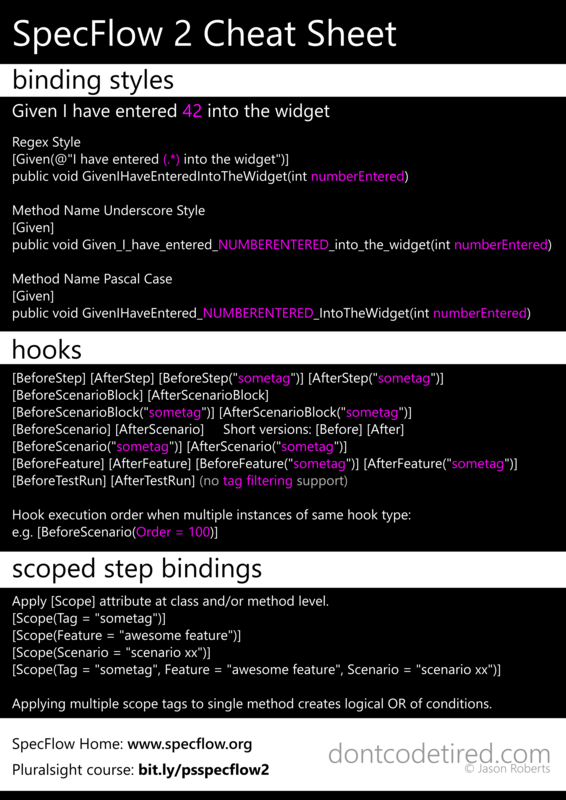 There’s a great set of documentation on MSDN that describes the following steps in detail. I’d recommend reading through them all before starting the process as there’s a number of warnings that should be observed before starting. For example “some popular games and apps will not work as expected, and you may experience occasional crashes and data loss. 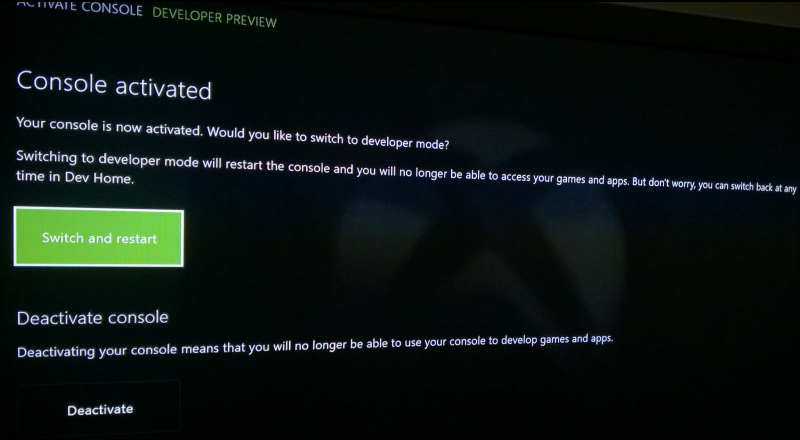 If you leave the developer preview, your console will factory reset and you will have to reinstall all of your games, apps, and content” [MSDN]. 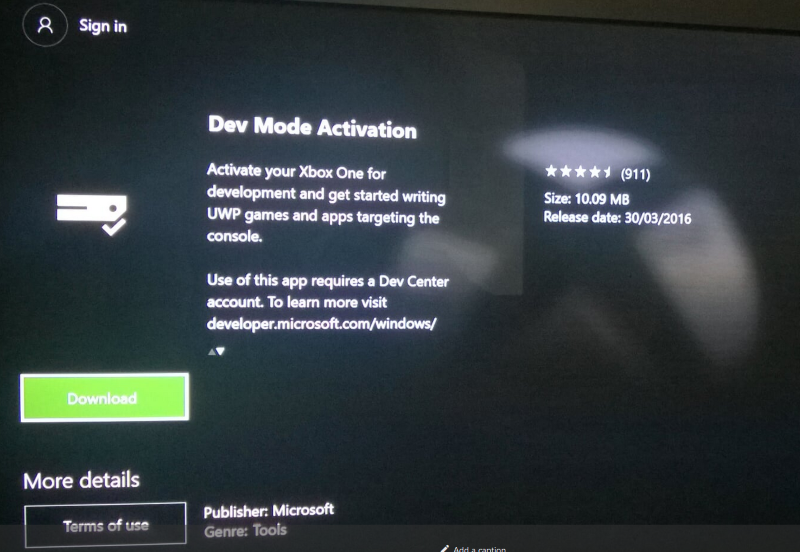 Also be aware that, to enable Xbox UWP app development in Visual Studio, the Windows 10 SDK preview build 14295 needs to be installed: “Installing this preview SDK on your PC will prevent you from submitting apps to the store built on this PC, so don’t do this on your production development PC” [MSDN]. I created a new Hyper-V virtual machine so as not to disturb my base machine. The documentation recommends using a hardwired network connection rather than wireless for better dev performance, I used wireless and for this simple app and it was fine. Also note “…system performance in this preview does not reflect system performance of the final release” [MSDN]. 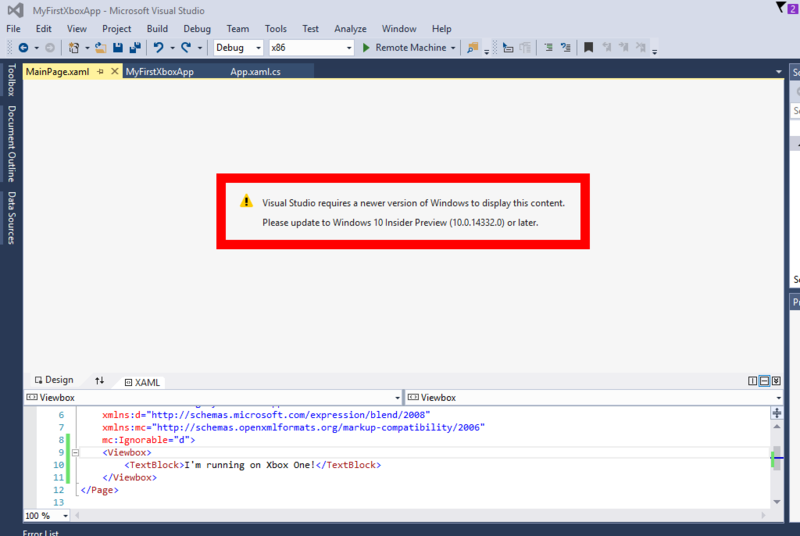 Also note that you don’t need the latest Windows 10 preview build to install the tools, the virtual machine I created was just running standard Windows 10 Pro, though as the following screenshot shows this seems to mean that there is no XAML visual preview in Visual Studio. The following is an overview of the main steps required, once again you should consult MSDN for full details/steps required/warnings. 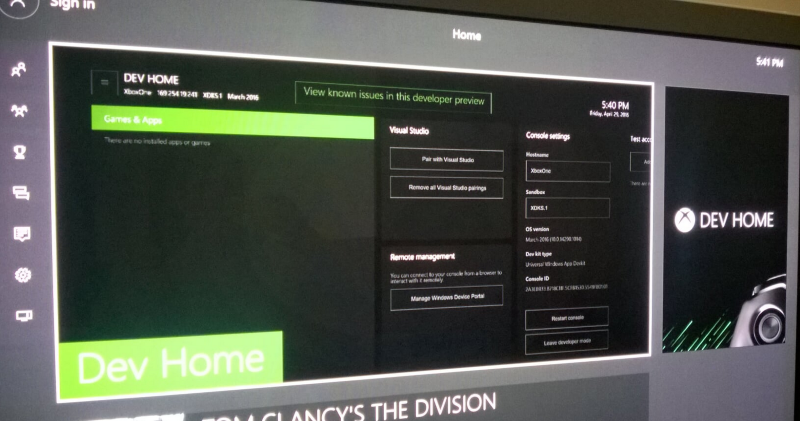 Sign in to Xbox One. 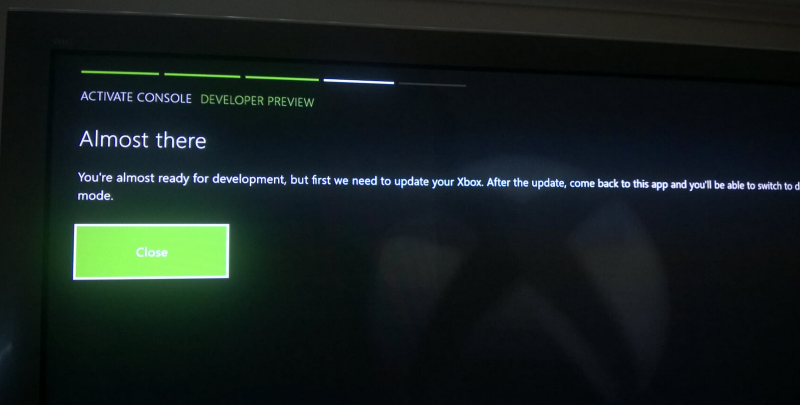 This can be a bit confusing as to what to do next, basically just leave it alone, at some point (perhaps hours) an “Update your Xbox” prompt will be displayed. Install the update and wait for it to complete and your Xbox restarted. 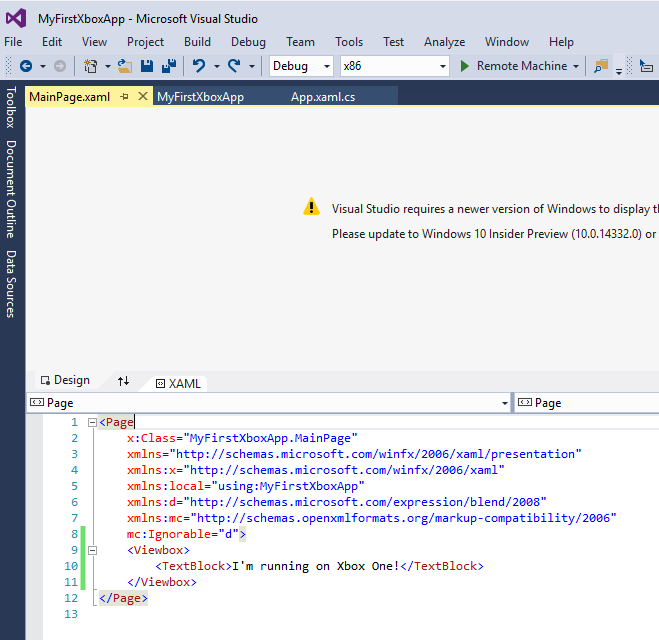 Create a new UWP project in Visual Studio. 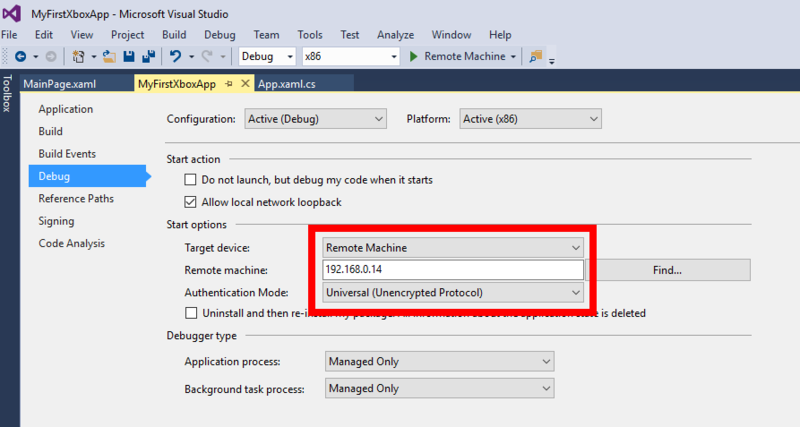 Open the project properties and choose Remote Machine, enter the Xbox One’s IP address, and choose Universal (Unencrypted protocol). Next run the app, and Visual Studio will ask you for a PIN, head back to the Xbox One dev app, and choose “Pair with Visual Studio”, you’ll be given a PIN that you can type into Visual Studio. 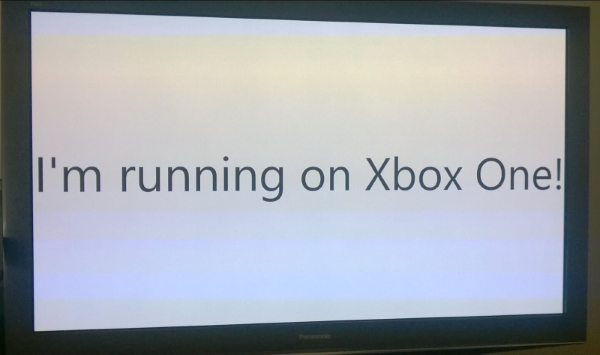 Your app should now be installed and run on your Xbox One! SpecFlow hooks allow additional code to be executed before and after various stages of the test execution lifecycle, for example running additional setup code before each scenario executes. The values of the Order property are arbitrary, you may use whatever values you wish, though it is sensible to allow some “wriggle room” for future additional steps by working in increments of 10 or 100 for example. To see hook ordering in action, check out my Pluralsight course: Business Readable Automated Tests with SpecFlow 2.0. Below is a revised version of my original SpecFlow cheat sheet updated for v2. Just right click, save-as to get your copy. My newest Pluralsight course was just published. Business Readable Automated Tests with SpecFlow 2.0 teaches how to create tests that the business can read, understand, and contribute to. These “English-like” tests (other spoken languages are supported) can be executed by writing test code that is associated with the “English-like” steps. Because the tests sit alongside the source code, they can become living (executable) documentation for the system, as opposed to an out-of-date Word document somewhere on the network for example. Check out the course here.